You will fly Alaska Airlines to Nome. From Nome you take 2 hour drive to Council. See Travel Information. This is where we will pick you up and your adventure starts. 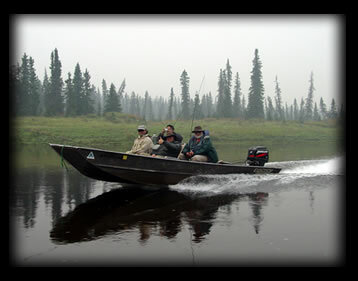 We will run you to the fish lodge 17 miles up river from White Mountain (very remote). 9-9:30 am Geared up and on the river--fishing! 12 noon Lunch on the river. 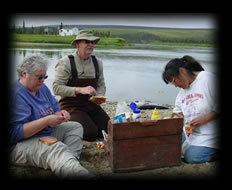 All during the day, you will be with a guide fishing different fish holes on the river. 6:30 pm Wrap up and head for dinner at the lodge. The trip starts when you are picked up in Council and ends when we return you to Council. Fees for Alaska state fishing licenses are not included in the rate. You should get your fishing license in Anchorage prior to arriving in Nome; alternately, you can order a fishing license online from the Alaska Department of Fish and Game website. Please allow 7-10 days for your license to arrive in the mail. We are not licensed to serve alcohol; if you prefer wine with your evening meal, or a cocktail in the evening, you are welcome to bring your own. Nome 's liquor stores can provide just about anything you would want. A deposit of 50% of the trip price is required to confirm your reservation, with the balance due 60 days prior to your arrival. 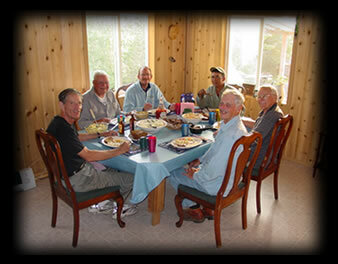 Wonderful Grayling Fly Fishing, Good Food, Alaskan Hospitality, Awesome Wildlife and Many Wonderful Memories!